I got dressed, went to my neighborhood chiropractor (who has always done a great job of keeping me tuned up), and asked what he thought it might be… we tried an adjustment… I went home and worked on a deadline (against doctor’s orders! couldn’t be helped! ), finished it, popped over to the store for a back brace and some cough syrup, and passed out. Comments with words of support and encouragement flooded in, and I will readily admit, preserved my sanity and bolstered my will enough to just put one foot in front of the other and walk the almost-three-miles up and down the hills to the new doctor’s office. Ever find yourself having a crap day, and then when someone surprises you with a kindness, it’s so unexpected and ameliorating by contrast that it almost makes you cry? Yeah. Like that. Except not almost. I love you guys. Exhale. Verdict: I had at least one swollen disk, ridiculously high blood sugar, a curvy spine, thinning bones, and need to take care of this vessel that I cart my brain around in. Doctor G’s plan for my being able to put my socks on again by myself was cutting out carbs and booze (sugar is an inflammatory, so that will help my disks chill out; also, I’d rather not give myself diabetes at 36!! ), adjustments as often as I could make it in, veggies, many many vitamins, walking, not sitting, etc., just to start. 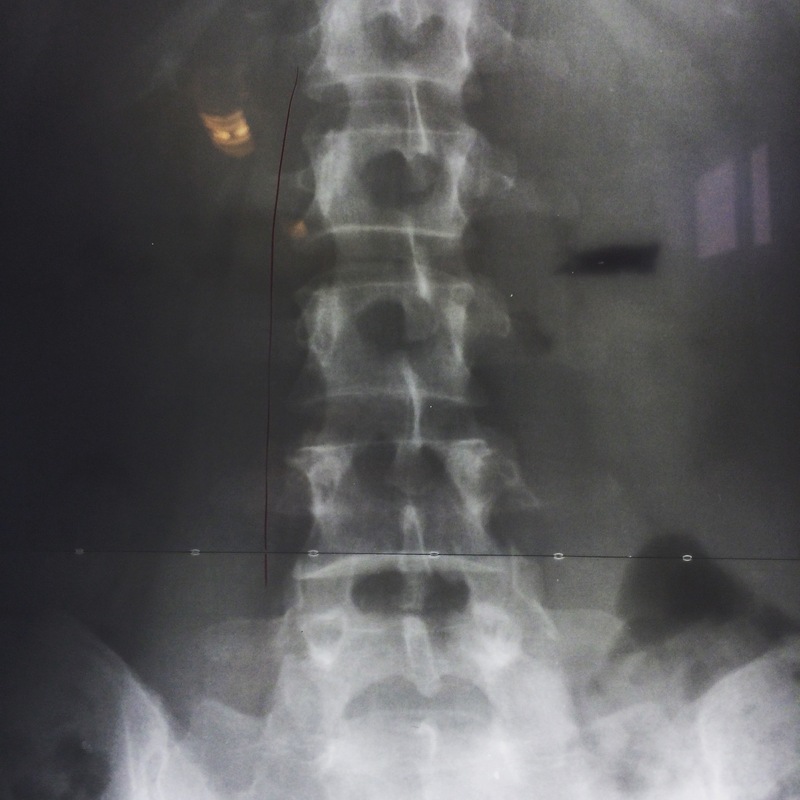 exhibit a: what happens to your spine when you barely spend time outside and don’t get enough vitamin D… kids, go play outside! My poor shark fins. They are not supposed to be so thin and so twisted. I always thought I was doing pretty well with being a good vegetarian and taking decent care of myself. 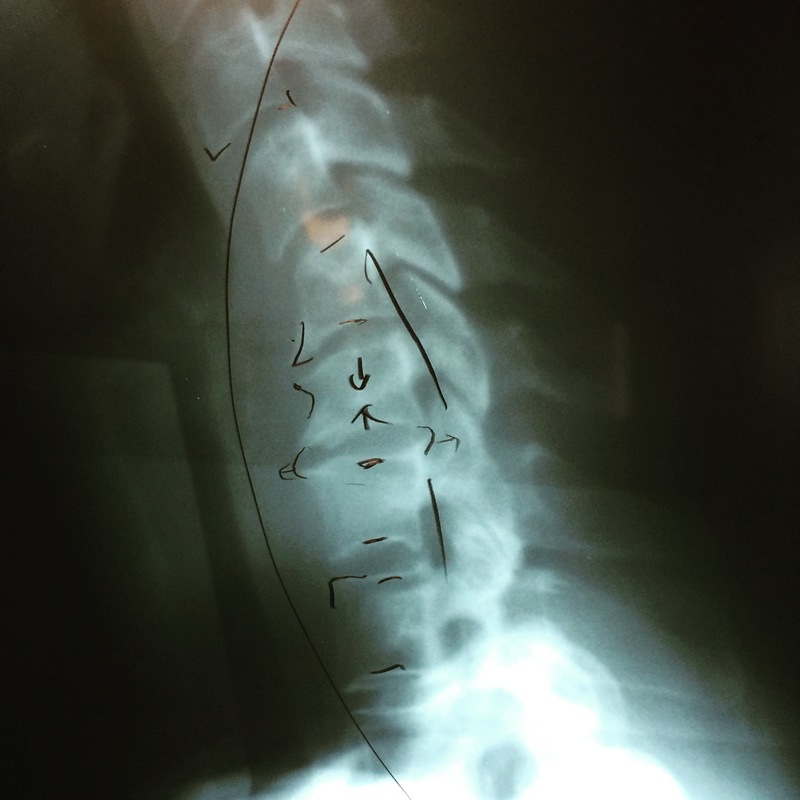 I wouldn’t have denied it if you called me a workaholic, but… nothing like seeing pictures of your misshapen vertebrae to inspire you to make some significant changes, and fast. exhibit b: what happens to your neck when you lean forward squinting at a screen for a living. This one of my neck was such a big surprise. It didn’t (still doesn’t) even hurt, but vertebrae are supposed to be relatively square, and necks are supposed to curve the other way. 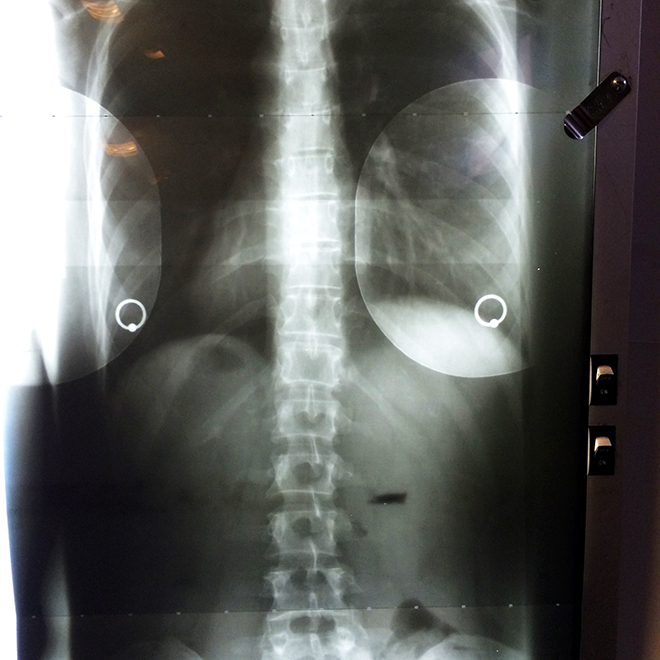 Clearly, these are very far from that… Quoth a friend: “Saw the x-ray photos… you’ve got some Lucky Charms going on in there!” Yep. Yikes! I came home this first day of seeing Doctor G and wrote a list of all of the things that were positives in my situation, and decided to keep focused firmly on those things, no matter how much I hurt or how frustrated I got. Over the next week, my friends were super supportive, I followed all of my Doctor’s Orders, and…. I got better. So, so, much faster than I could have imagined, given how incredibly excruciating the initial injury was. I’m not a writer, so this post will have the most words by far; I’ve just been taking photos as I walk, and mapping where I go… I’ve made a goal to walk down each street in San Francisco at least once! Let’s see if I can… Where should I go tomorrow?